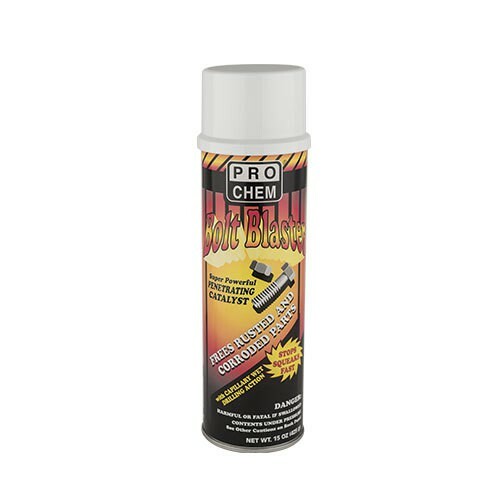 Bolt Blaster | Pro Chem, Inc.
BOLT BLASTER is a super powerful penetrating catalyst that frees rusted and corroded parts and stops squeaks fast. It features a capillary wet-drilling action which creeps and pulls itself up, around, and into cracks, crevices and threads. It reduces friction and wear over a broad temperature range. BOLT BLASTER leaves an ongoing lubricating film to protect against future rust and corrosion. Powerful jet spray helps provide rapid penetration of rust and corrosion. Safe on most plastics, rubber, and painted surfaces. Saturate part to be loosened and allow product to penetrate for a moment before attempting to break free. For heavily encrusted pieces a wire brush may be used to help remove corrosion. Apply a light final spray to all parts prior to reassembly.